AT THE HEIGHT OF THE SIXTIES, a group of Texas writers stood apart from Texas' conservative establishment: Bud Shrake, Larry L. King, Billy Lee Brammer, Gary Cartwright, Dan Jenkins, and Peter Gent. Calling themselves the Mad Dogs, these six writers--closely observed a nation in transition. They were eyewitnesses to the Kennedy assassination; Lyndon Johnson's rise to national prominence; the Civil Rights Movement; Tom Landry and the Dallas Cowboys; Willie Nelson, Jerry Jeff Walker, the new Outlaw music scene; the birth of a Texas film industry; Texas Monthly magazine; the flowering of "Texas Chic"; and Ann Richards' election as governor. In Texas Literary Outlaws, Steven L. Davis makes extensive use of untapped literary archives to weave a fascinating portrait of writers who came of age during a period of rapid social change. 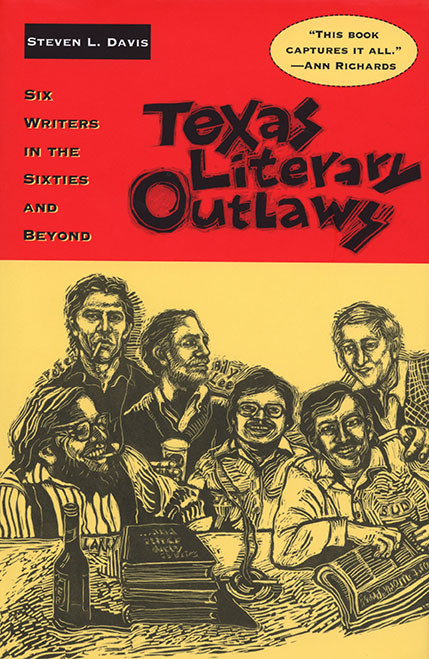 With Davis's eye for vibrant detail and a broad historical perspective, Texas Literary Outlaws moves easily between H. L. Hunt's Dallas mansion and the West Texas oil patch, from the New York literary salon of Elaine's to the Armadillo World Headquarters in Austin, from Dennis Hopper on a film set in Mexico to Jerry Jeff Walker crashing a party at Princeton University. The Mad Dogs were less interested in Texas' mythic past than in the world they knew firsthand-a place of fast-growing cities and hard-edged political battles. The outlaws crashed headfirst into the sixties, and their legendary excesses have often overshadowed their literary production. Davis never shies away from criticism in this no-holds-barred account, yet he also shows how their' rambunctious personae have deflected a true understanding of their deeper aims. Despite their popular image, the outlaws were deadly serious as they turned their gaze on their home state, and they chronicled Texas culture with daring, wit, and sophistication.